What Skills And Training Does A Machinist Need? | Kosmo Machine, Inc. The role of a machinist is very important for ensuring all metal components and parts are produced and designed in a manner that conforms to the highest industry quality standards. Also, the machining process has to be managed safely and reliably to avoid the possibility of injuries in the workplace, or damage to the machine tools used for cutting materials and metal components. These requirements mean that a machinist must be highly skilled and adept in carrying out complex milling and turning tasks. This is especially true with regards to a CNC milling machine, due to the variety of tools and programmable settings that have to be configured to ensure the effective quality of finished parts. Following are the skills and training that a machinist is required to undertake. 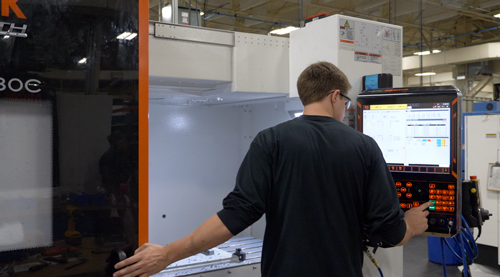 Our machinists are required to operate a CNC milling machine, they must have an understanding of the software, and be able to program codes to enable specific cutting dimensions for various industrial applications. Being familiar with the technical aspect of the job will ensure the machinist is able to follow technical instructions on the job, understand various blueprints required for individual industrial usages, and be able to follow instructions and make assessments without any difficulties. Of course, the setup requirements for CNC machines will vary from industry to industry. Nevertheless, a machinist should be adept in the technical aspects of the role, to understand different machining requirements to produce and design specific metal components and parts. Apart from this, there are no high qualifications required for one to become a machinist. In most cases, a high school diploma is sufficient to meet the educational requirements. The main skills hinge on being proficient in computers and math, an attention to details, problem-solving, and accuracy. All machinists are obliged to undertake an apprenticeship and on-the-job training. Upon completion of an apprenticeship, you can gain the credentials to operate as a machinist. You can also take examinations from the National Institute of Metalworking Skills (NIMS) and become certified to become a CNC setup programmer. Furthermore, there are also 2-year degree programs that can be found in some technical colleges. However, an on-the-job training is most preferred for gaining the skills and expertise to work as a machinist. Undergoing this training process can equip you with the practical skills and requirements of producing metal components and tools for different industrial applications, and ground you with real and practical knowledge. If you would like to learn more about career opportunities at Kosmo Machine, please click here.